Because life has not been quite complicated enough for the Little Family, Bethany is having oral surgery this morning — hence my unexpected trip to Boise. This, however, allowed me to personally deliver the unicorn sent by Alise (THANK YOU ALISE) and the dress made by PLA3 Dresses. Berkeley is happy and cheerful — and living with a yet unknown diagnosis. On a special diet, her blood sugar is stable. Her parents — under the direction of the genetics physician — will soon begin some experiments with certain foods to see how they impact her blood sugar. Genetic testing is proceeding. That all sounds so easy and smooth — the reality is far from it. The health care system does not always operate as such, and when things are complicated the system seems to struggle more than usual. Good intentions and skilled professionals are not always enough. When the genetic testing did not happen, one office blamed the insurance company, and the insurance company claimed no orders from the office — and nobody involved the parents to discuss so they could activate their own advocacy resources. And then when advocacy resources are utilized, the inherent hierarchies in the health care system mean that questioning can cause massive ruffling of feathers, further amplifying the dependent, fearful (aka less powerful and don’t forget it) position of parents. It all causes one to speculate who exactly is at the center of this “patient-centered” approach — or is that just a quaint notion from Corporate?! As one of the advocacy resources, let me just tell you this has been a scary look into health care gaps and inequities. What happens to young families who do not have people to light fires and ask questions?? My new friend, the Case Manager, got things straightened out and said that the genetic testing can proceed once the parents had this particular test done. The only problem is said parents did not know that particular test was to be done and have received no instructions for doing it. In a crisis or complicated situation there are so many places where things can fall through the cracks and/or be misunderstood. This is not about blame. After all, perfection in anything is not part of the human experience. I remind myself: Everyone is doing their best. Assume good intentions. Remember the value of Grace for our very human missteps. Repeat. 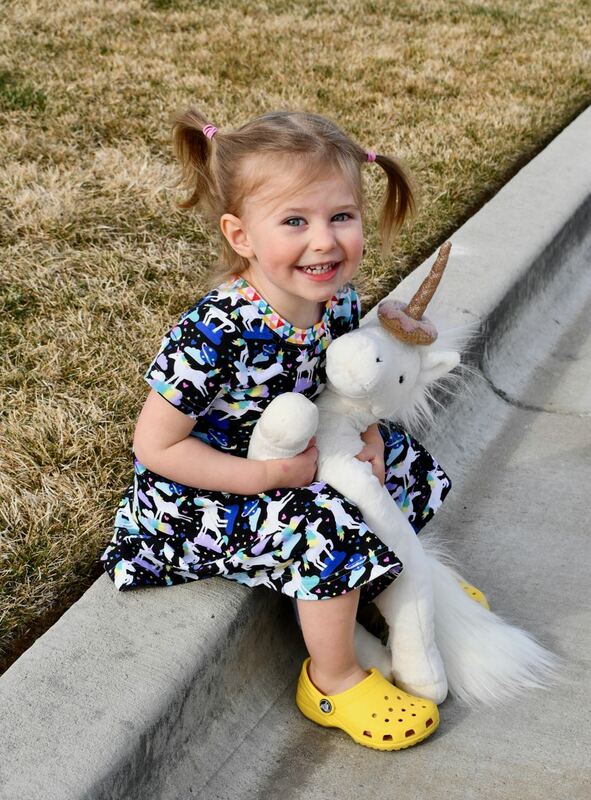 And one cannot underestimate the value of unicorns with donuts - and the perfect dress. Team Berkeley is a mighty force — because that is what is needed and deserved. Thanks for being part of it.